In difficult times being given £40,000 to buy new equipment will certainly go a long way, especially when you are looking to help local NHS patients in the local area. Well the League of Friend at the former Bovey Tracey Community Hospital have done just that. A bladder scanner:– user to determine whether there is a need or not for catheterisation. These are vital and important bits of equipment avoiding unesscary trips to the hospital. This can also ensure that.a patients discomfort and anxiety can be relieved by earlier treatment. A Doppler ultrasound scanner:- a special piece of equipment designed to check the amount of blood that is flowing through the arteries and veins. It can help detect abnormal flow within an artery or blood vessel. Vital for the management of leg ulcers and peripheral vascular disease. Syringe Pump: – a small, portable, battery powered infusion device, designed primarily to support patients in their latter stages of life by providing pain relief and symptom control medication. Portable ECG devices that link to the nurses smartphone: A smartphone based ECG works by recording a patient’s heartbeat at home while they are experiencing symptoms. The ECG result can then be sent to and accessed by a doctor who will interpret the result and decided on what treatment to make available. 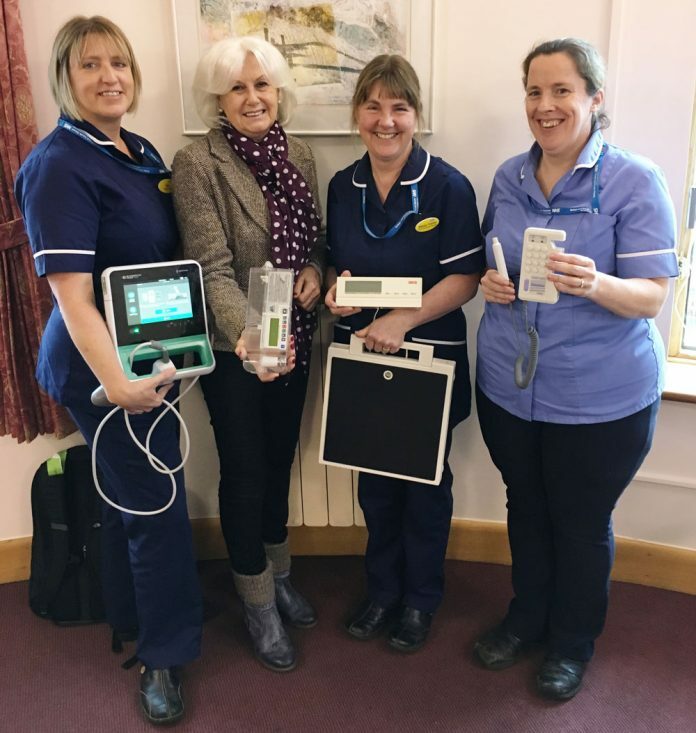 On behalf of Bovey Tracey’s League of Friends, we are delighted to be able to help the Community Services Team in our area by providing lifesaving equipment that will be used in their everyday working lives helping the people who need it so much. We are really grateful to the League of Friends for their very generous donation and I would like to thank them on behalf of our staff and all the patients who will benefit from the new equipment. These ‘additional extras’ not only make our working life better but also greatly improve the services we can offer our patients. All the equipment that has been purchased by the League is portable so can be taken out to patient’s homes which can prevent them from needing to visit either their GP surgery or hospital. The League’s very kind donation will help so many of our patients and make a real difference to those who need our services in the future.